Over the last 17 years, Lawrence Hass has become known as a leading, eloquent spokesperson for the magicial arts. You can see an example of this in his celebrated TEDx Talk, "What Is the Art of Magic?" Even so, Lawrence has been invited and hired to speak about magic in many different contexts. 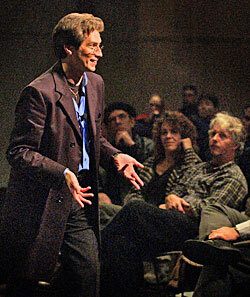 For example, he has given dozens of interviews about magic on radio, television, and for documentary films. Also, he has given performance-lectures on magic as an art form and important human experience at hundreds of schools, colleges, universities, and civic organizations. In corporate contexts, Lawrence is frequently hired to deliver talks and keynote performance-presentations on how expert magicians create impossible things as a metaphor and model for personal and organizational achievement. "What is Magic? A Performative Presentation"
"The Art of Living: Finding and Following Your Passions"
"Creativity, Excellence, Implementation: A Magical Path toward Personal Growth"
"Living and Thinking Creatively: A Hands-On Workshop." So give Lawrence a call the next time you are considering a program or workshop for your colleagues, clients, employees, members, and friends. He will work closely with you to create a dynamic experience that will leave your guests feeling energized, amazed, and inspiried.